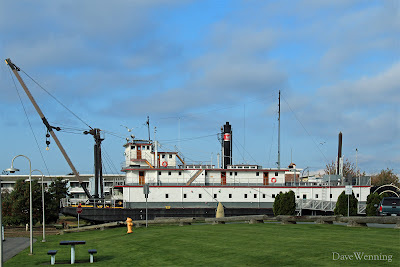 The Snagboat W.T.Preston is a stern-wheeler on permanent display adjacent to downtown Anacortes, Washington. Head down R Avenue and you will spot it on the north end of the Cap Sante Boat Haven. Shallow-draft Snagboats worked to remove navigation hazards from the rivers along the length of Puget Sound including the nearby Skagit. The Preston operated from 1929 to 1981 and is on the National Registor of Historic Places. The seagull headed for the pilot house is not.